Rep. John Conyers speaks at the Charles H. Wright Museum of African American History in Detroit Sept. 16, 2013. The News: Longtime Michigan Rep. John Conyers is expected to ask a federal judge in Detroit on Wednesday to put his name back on the Democratic primary ballot. Conyers, the longest-serving African American in Congress, is challenging the decision of the Wayne County, Mich., clerk that he didn’t submit enough signatures for his name to appear on the ballot for Aug. 5. The clerk invalidated more than 400 signatures, causing Conyers to fall short of the required 1,000, because the collectors of those names were not registered voters. State law requires petition circulators to be registered voters. Conyers joined a lawsuit filed by the American Civil Liberties Union on behalf of the petition circulators. The ACLU argues that the law is unconstitutional because it violates the petition circulators’ rights to free speech and political association. Last week Conyers’ re-election bid, in light of his legal fight, received the support of the Congressional Black Caucus, which Conyers co-founded, and President Barack Obama, by way of the Democratic National Committee. 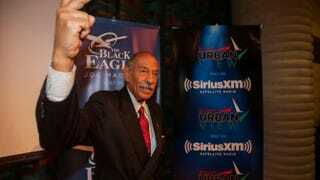 The Take: You’d think that after doing this 25 times, Conyers would have it down pat. You’d think the distinction of becoming the longest-serving member of Congress, should he win a 26th term this year, would be incentive enough to do it right. But this is John Conyers, whose tall legislative achievements and enduring ideological vigor at 85 years of age are matched by his wont for aloof and lazy handling of administrative details, not to mention an embarrassing knack for ethical and personal troubles. At Conyers’ orders, his staff members baby-sat his children and—in violation of ethics rules governing Congress and every other elected office at any level, anywhere in the United States—worked on political campaigns, including that of his wife, Monica (more on her later). His driver’s license was suspended after his renewal check bounced. Speaking of vehicles, he reimbursed the Treasury Department $5,682 after the disclosure that his son was pushing a 2010 Cadillac Escalade leased by Daddy’s congressional office at taxpayers’ expense. In a city inundated with vacant buildings and whose residents are struggling to keep their homes out of foreclosure, Conyers owned abandoned, blighted homes about which he apparently knew little. Back to his wife, the ex-con. Monica Conyers was released from prison last year after serving 37 months for taking cash kickbacks while serving on the Detroit City Council. Conyers himself had been implicated, though not investigated. So it’s no wonder that the Conyers re-election campaign was on autopilot. One of the campaign consultants has publicly taken the blame for hiring the ineligible petition collectors. The other consultant involved? He would be Skip Mongo, who works for team Conyers, while his brother Adolph works for Conyers’ opponent. That’s right. Disclosure: I used to cover politics in Detroit and know Adolph Mongo and Steve Hood, the Conyers campaign aide who took the heat for the petitions. I know Mongo and Hood to be outspoken, wily figures usually near the center of the melodrama, and sometimes psychodrama, that is Detroit politics. Their records as campaign operatives are checkered with as many defeats and controversies as victories. Case in point: One of the petition collectors hired by Hood is a fugitive from justice. Conyers has a solid argument to make for the restoration of his disqualified signatures, especially given the Supreme Court’s latest (and wrong) ruling in favor of expanded protections for political speech. If he doesn’t get on the ballot by June 6, he’d have just two months to wage what would have to be an aggressive and costly campaign as a write-in candidate. It’s achievable, but the dean of America’s black lawmakers will finally have to knock off the cobwebs.